Some might argue that a true sangria is red. Me, I don’t care either way. It’s sangria. When you’re drinking sangria – regardless of the hue – life is automatically good. Who would want to argue with that? 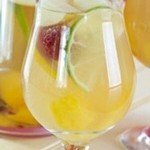 Peel peaches and melon, cut into small cubes and cut the orange into slices place them in a jug with wine and liquor in the fridge for 2 hours. Just before serving , add the lemonade , raspberries and full of ice.